One of the benefits of living in Chicago is that a majority of places are a short flight away. New York City is only an hour and a half, Miami is a little under three, Denver is two hours away and you can even leave the country on a one hour flight (that’s shorter than my commute to work!). Compared to the distances in Europe for example, these flights seem long but being able to travel such distances across North America in little time is convenient. This was why when we were choosing a destination for our anniversary, R and I chose Toronto, Canada. As international as we could get for a weekend getaway. Instead of buying each other gifts this year we decided to put the money towards a trip. Most tropical locations have their rainy season this time of the year and the thought of being stuck on a rainy island our whole trip didn’t sound appealing. 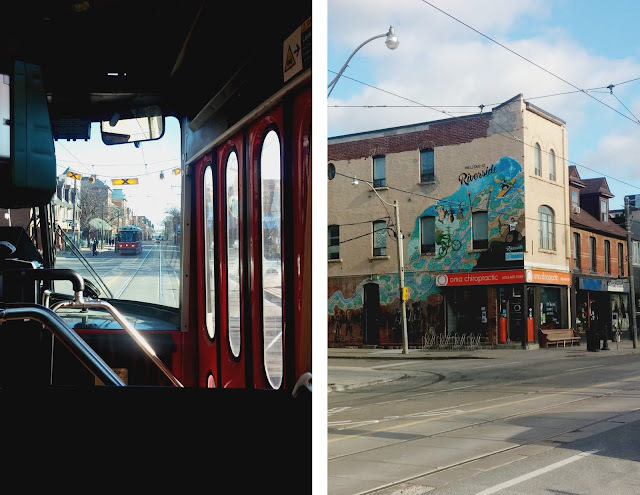 Toronto won and ended up being an exceptionally fun city to explore – for 48 hours. We landed Friday evening and directly caught a town car to the hotel. It was our anniversary trip so why not splurge the extra ten dollars on a luxurious ride. 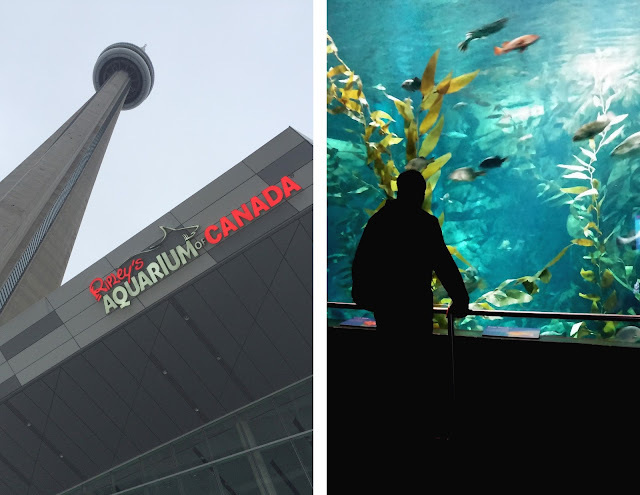 We drove along the lakefront to The Delta Hotel, located in the center of Toronto, just a street away from the CN Tower, Ripley's Aquarium of Canada and Lake Ontario. A friendly concierge greeted us and after I mentioned we were celebrating our anniversary he happily upgraded us to a room with a spectacular view. The hotel had a restaurant on the first floor that was open late so we grabbed a quick bite to eat before heading to bed. The next morning I woke up realizing I had left my camera battery in its charger back in Chicago. After a mini panic attack and feeling like the world’s worst blogger, R and I went in search of a new battery. I have a Nikon D3000 which is an older model and the first place we stopped at didn’t carry the battery or camera. At the third place we stopped in, I had the option to rent a camera for the weekend for $100 but wouldn’t be able to return it until Monday, which was impossible since we were leaving Sunday night. Our trip would have to be documented with my LG G2 and R’s iPhone 5 – yes we both need to upgrade. We couldn’t spend all morning searching for a battery or else we would be late for the culinary tour, our phones would have to suffice. 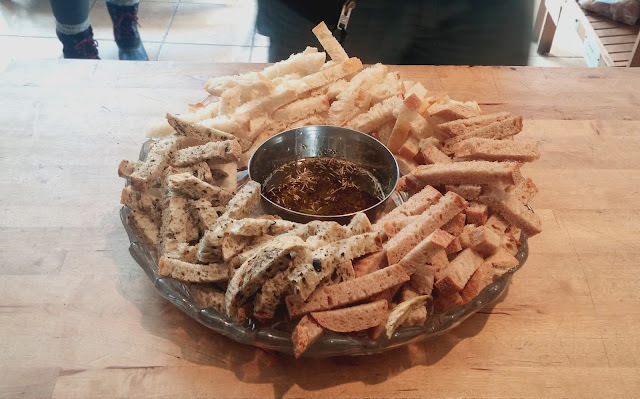 After my trip to Miami in May (read here) where I went on my first culinary tour, I fell in love with the idea of finding similar tours when I travel. It’s a great way to see a city while learning about the local culture and cuisine. 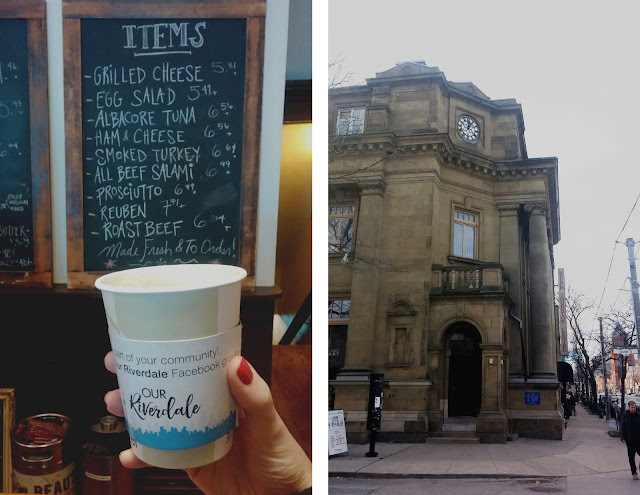 On this trip our tour took us through Leslieville, where we would learn about the history of Toronto’s oldest neighborhood and try local foods. 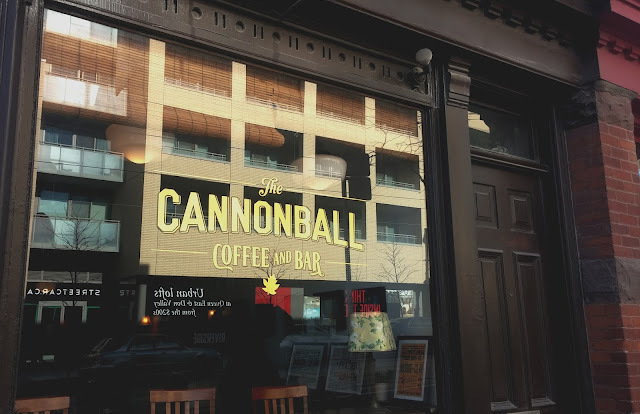 The morning was sunny with a slight chill in the air so we began our tour, led by Ian and Kevin (the founder of Culinary Adventure) with a warm beverage at The Cannonball Coffee and Bar. 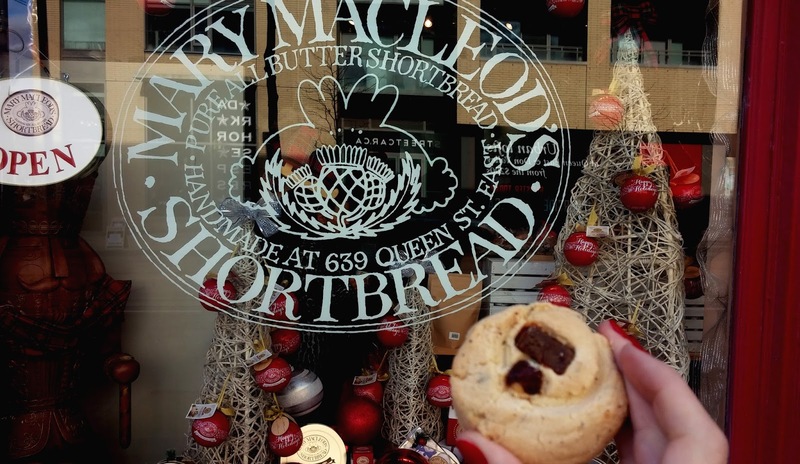 Just next door was our second stop – Mary Macleod’s Shortbread. Ian held out a fresh box of shortbread cookies for us to all try and I have to say it was the most delicious and buttery shortbread cookie I have ever had. Mick Jagger even has a box of these cookies delivered to him while he is on tour! 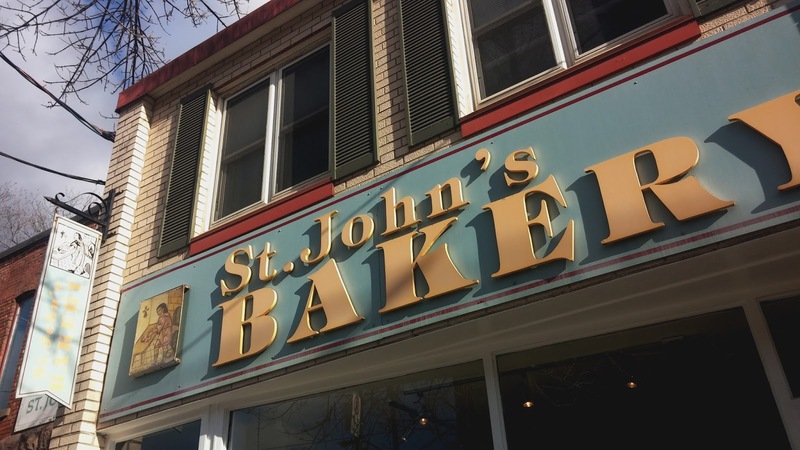 Walking through Leslieville we turned down a residential street and went into St. John’s bakery. Fresh loaves of organic bread were baking in the back room as we all gathered around to hear the story of how the bakery began and enjoy samples of the bread set out for us. Years ago a man showed up at the steps of St. John Mission, the priest found him and told him to come in to stay warm. The man thanked him and told him he had lost everything – his wife, his home and his bakery. Thanking the priest for taking him in he began to bake bread for the local community. Today they still use his recipes when baking and provide work for those with disabilities. It was beginning to get cold as Ian and Kevin took us to Tabule for drinks and unique Middle Eastern dishes. Sipping on my wine I enjoyed the number of plates that were brought out for us to try: the falafel, slices of fried eggplant that I couldn’t stop eating and baked cauliflower. The entire meal was satisfying and flavorsome. We spent the hour clearing each dish and sharing stories about where we were from. 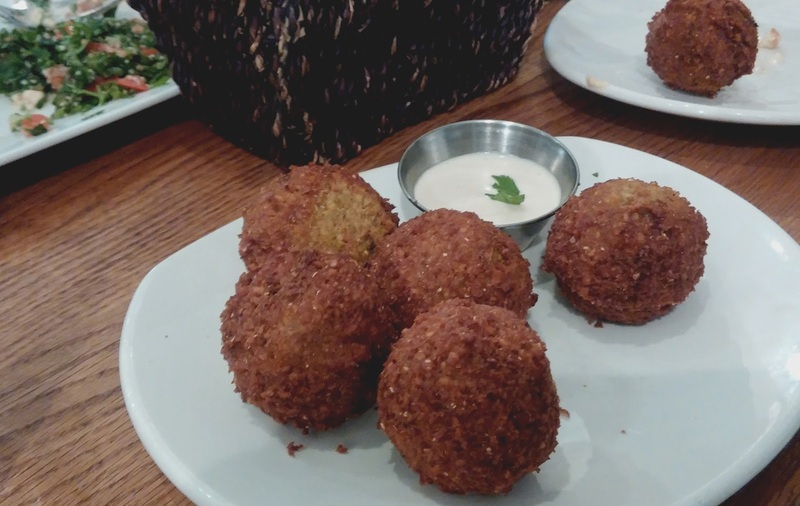 It was nice to have a moment to sit back and enjoy the food without worrying about rushing off to the next place. Kevin was kind enough to answer all of my many questions about Canada and Toronto. 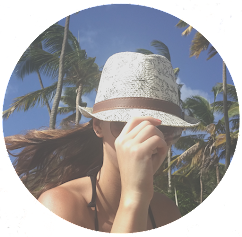 I’ve noticed I like to ask locals a lot of questions when I travel because I believe your learn more valuable information from a local then you would from a guidebook. Not that guidebooks aren’t helpful but I love being able to talk about current events and listen to someone share their city with me. 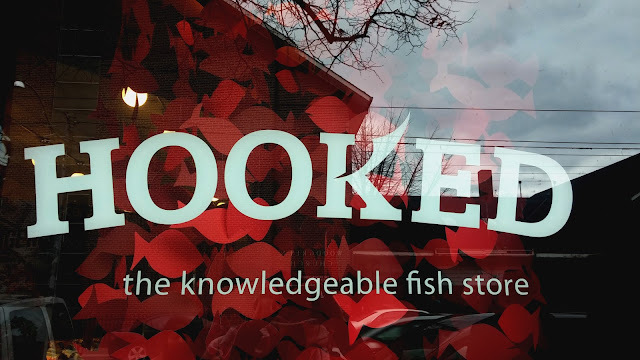 With full bellies we headed to Hooked – The Knowledgeable Fish Store. 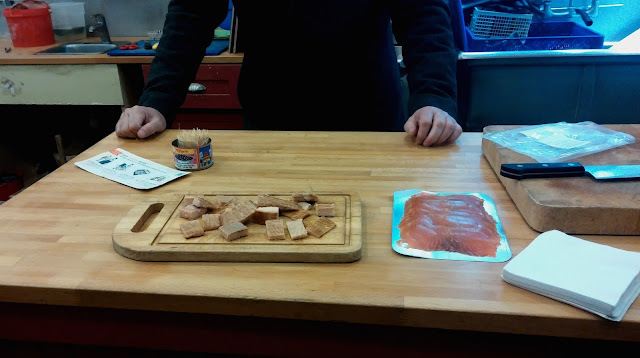 Samples of smoked salmon and tuna were laid out for us as Ian explained how Hooked use fishermen they trust and their methods of catching fish are ethical. To end the tour we all got to choose a scoop of ice cream from Ed’s Real Scoop. I would never have thought to venture over to Leslieville while in Toronto but thanks to the culinary tour we were able to discover new foods and the history behind one of Toronto’s most charming neighborhoods. 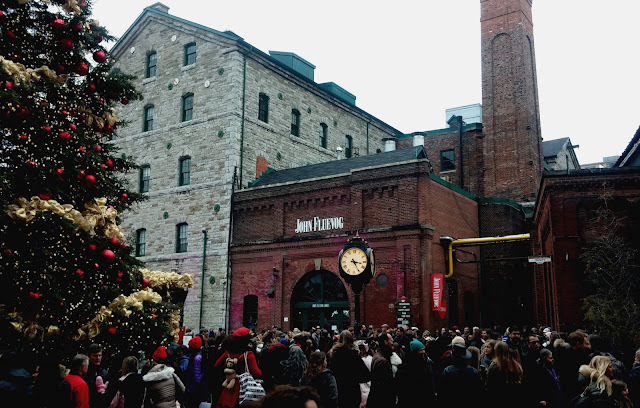 Visiting the Toronto Christmas Market was high on my list, thankfully Leslieville is close to the Distillery District where the market is held each year. We paid the small entrance fee and took our time strolling around the stalls selling Christmas goods. The aroma from the food stalls was tempting but after having eaten so much delicious food we couldn’t imagine having another bite. If you are ever in Toronto during the holidays, I recommend you stop at the Christmas market, especially if you are traveling with children. You can wander for hours while enjoying the festive Christmas spirit. As the sun set the temperature began to drop so we took a cab back to our hotel and enjoyed the hot sauna offered at our hotel. Another item on our must see list while in Toronto was the CN Tower, luckily our hotel was right across the street. There was a chance the next day would be foggy so we decided to go up the CN Tower that night. The glass elevator shot us up the tower and within minutes we had the entire city glowing below us. 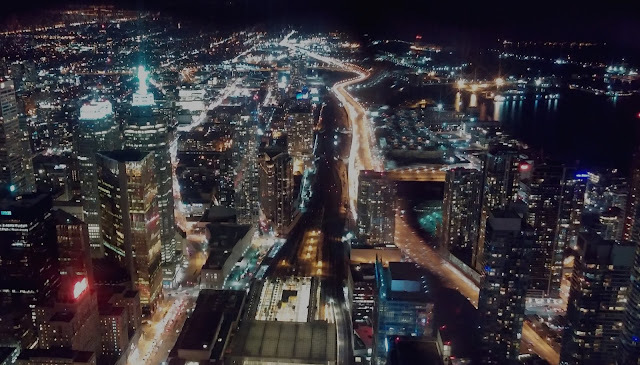 It was quite the view to see the city of Toronto lit up alongside Lake Ontario, similar to Chicago and Lake Michigan. Taking in as much of the panoramic views as we could while bracing the cold winds we soon decided to head for dinner. 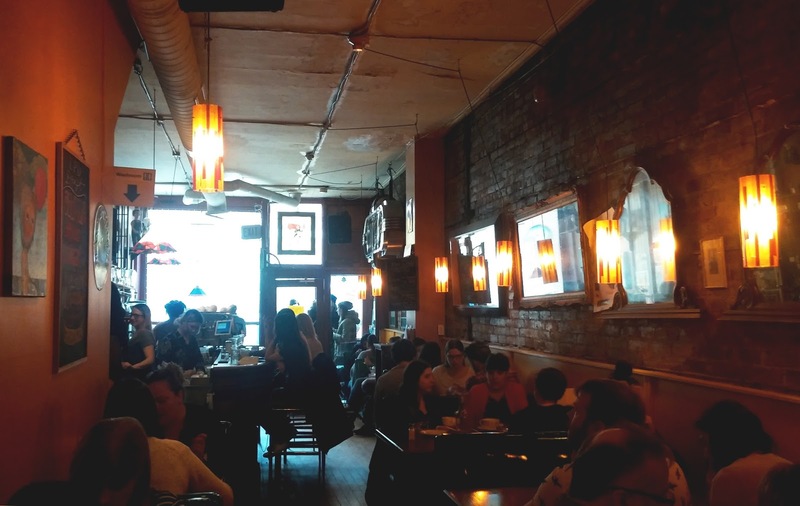 Earl’s, a favorite Canadian restaurant of ours has a variety of foods and drinks as well as a lively atmosphere. We enjoyed drinks at the bar before we were seated to eat more food that I thought possible in one day. After dinner we strolled back to the hotel taking in the city at night. We had passed St. Lawrence Market the day before on the cab ride back from the Christmas market, curious about what was inside we decided to check it out and grab breakfast. Unfortunately the market is closed on Sundays, but two blocks away is Le Petit Dejeune. 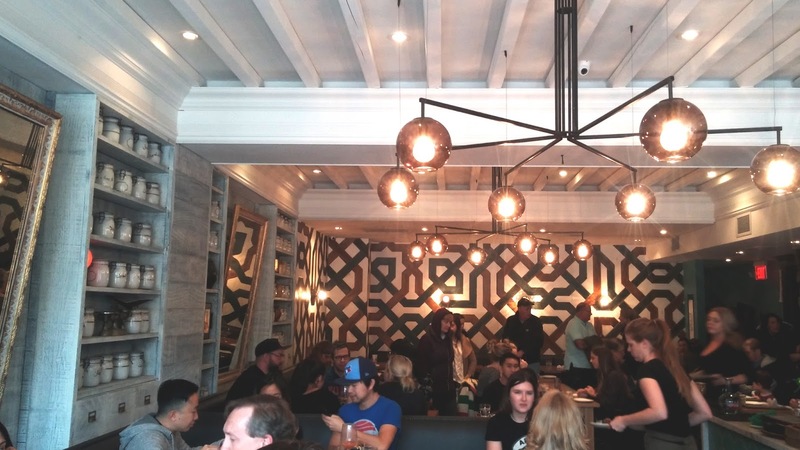 As a highly ranked restaurant, it was no surprise to find a line out the door when we found it. We were both hungry but decided why not try a place that seemed to be popular with the locals. Not too long after getting in line we were seated in the warm and fragrant Belgian-Canadian comfort food restaurant. Our waitress brought us our mimosas and we raised our glasses to toast our anniversary and finding a perfect breakfast place. The Belgian waffles we ordered were light and filled with a sweet taste that for a moment I thought I was back in Brussels. 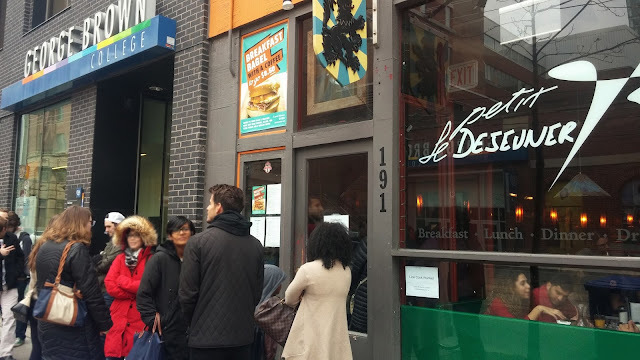 If ever you are in Toronto looking for brunch, I highly recommend stopping at Le Petit Dejeune, it’s well worth the wait. 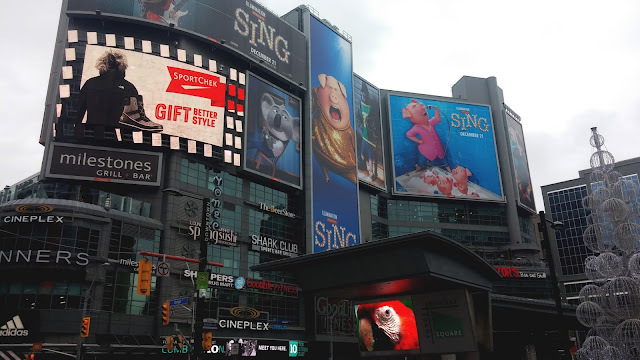 We slowly wandered towards Yonge-Dundas Square which reminded us of a mini Times Square with the many billboards and stores. 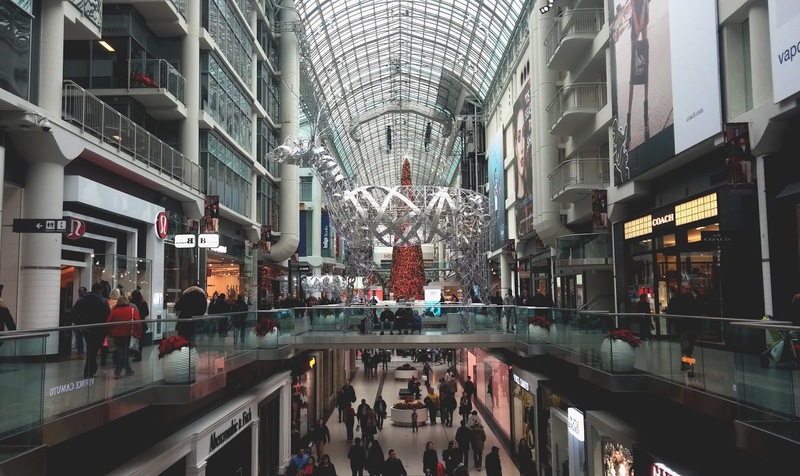 One of the best shopping in Toronto is in the Eaton Center, located conveniently in Yonge-Dundas Square. Warming up we walked the entire length of the mall and stopped in at Roots, one of my favorite Canadian stores. Lately I have been obsessing over candles and Roots had a few to choose from. One is burning next to me as I write this post. 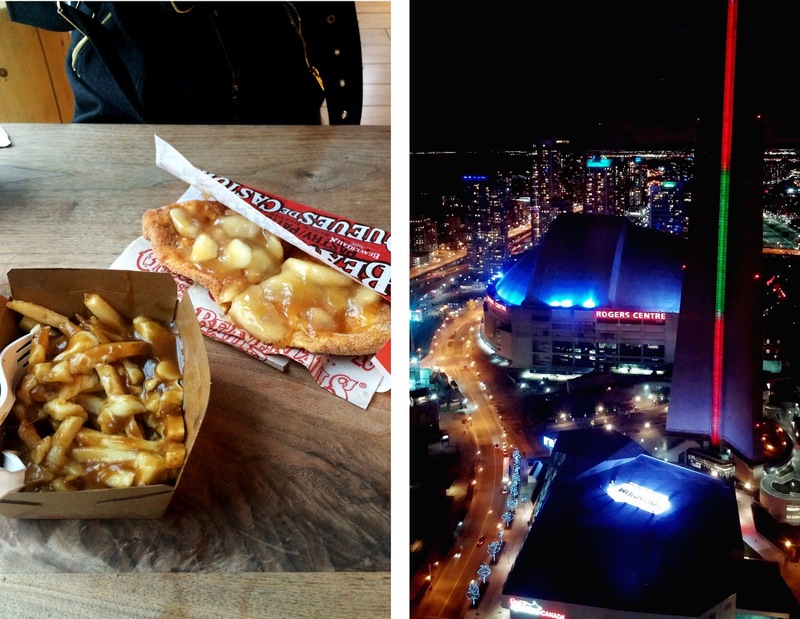 To continue eating our way through Toronto we went in search for beaver tails. No, not actual beaver tails but heavenly pieces of fried dough sprinkled with sugar and your choice of a variety of toppings. We found the small red building tucked away between the tall residential buildings along the lakefront. Happy to have found the place we went inside to indulge ourselves. We didn’t just have a beaver tail each we also ordered poutine, a Canadian snack of warm gravy poured over French fries and cheese curds. Thankfully we had been walking so much the past two days that we didn’t feel as guilty eating this amount of food but how can you say no to so much yummy goodness? On our way to the airport we were sad to leave Toronto. 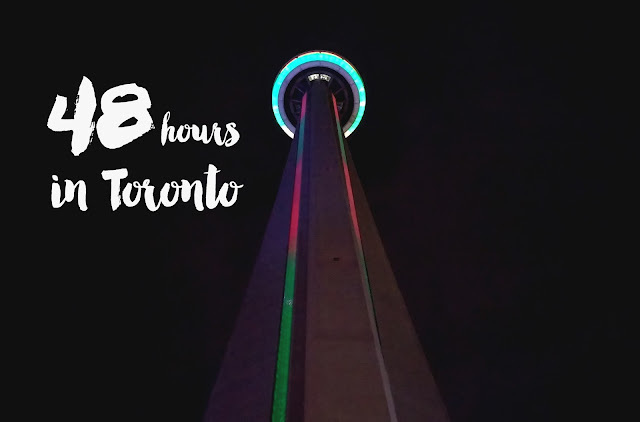 In just a little over 48 hours we got to experience the history and food of Leslieville, explore the Christmas market, see the city at night from the CN Tower, stuff our faces with local dishes and wander through Ripley’s Aquarium. We ended up staying a few hours longer than planned after arriving at the airport to find that our flight had been canceled due to heavy snow in Chicago. It took a few hours to deal with several mechanical problems with the plane, arguing with United Airlines staff to book us on a flight and weather issues before we finally took off. At least I get to share the memory with Dennis Quaid who was checking into his flight at the ticket counter next to us. Since I visited Toronto last summer, I see it through different eyes when looking at bloggers' photos. It's so nice to revisit the city through your photos. Shame about the camera incident but these photos are great enough! Happy New Year. Toronto is definitely a lot of fun =o) Thanks for the sweet comment! I would love to go there some day, it looks so nice and friendly! Hope you had a lot of fun! You have to visit Toronto =o) It's such a great city to explore! Great post and pictures ! Kind of miss living in Canada. These are great photos, I want to visit! and now I'm hungry! hahaha! Those bread slices though!! I've never been to Toronto, but I do really want to visit. Along with Montreal. I love the architecture and overall vibe I see in photos. I've heard the food is amazing too, which I'm glad you showcased here. Sounds like you had a fabulous time!! I used to live in Toronto but I haven't been back since 2007! 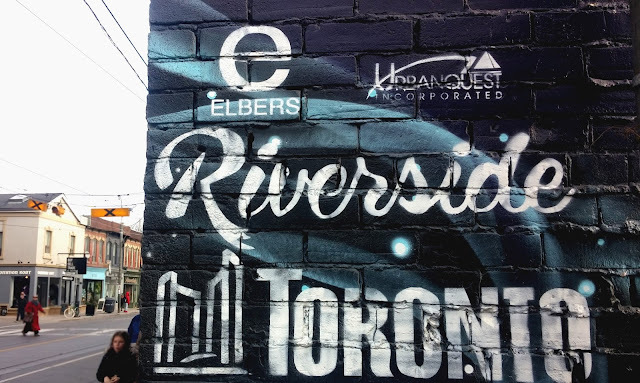 How cool you got to live in Toronto =o) Definitely worth a trip back! The foodie tour is a fantastic idea, I would love to do the same. You're so lucky to live so close to all these places. 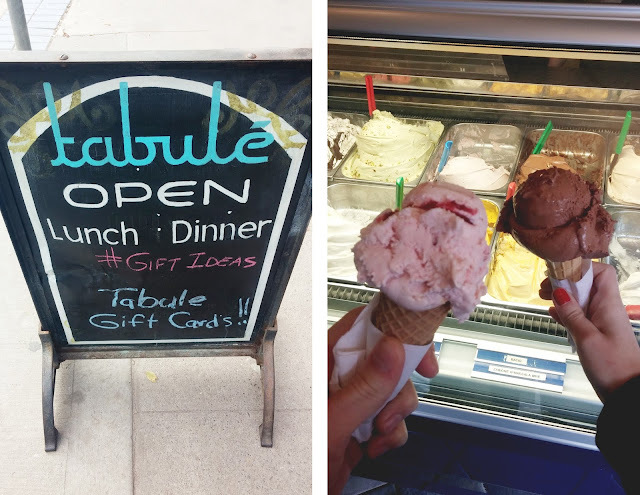 I now recommend a food tour to anyone when they are traveling =o) They are so fun! Thank you =o) Shorter trips can definitely be fun! I've always wanted to visit! The food looks sooo amazing! Wonderful post and photography my dear! The Christmas market looks so beautiful and a great place to visit! Wishing you a great 2017 full of beautiful adventures! I can't believe all these pics are off a phone, they're fab!!! 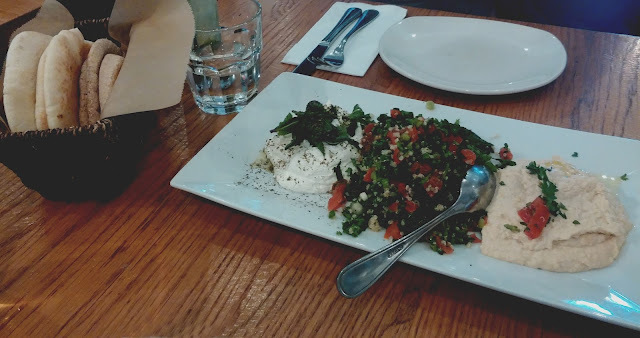 Definitely want to visit Toronto, those pics from Tabule have my mouth watering. Wow! Can't believe how accessible these places must have been for you. :) There's so much to see in North America, and I wish I can go back! Btw, your photos are all beautiful. Hope to hear from you soon! 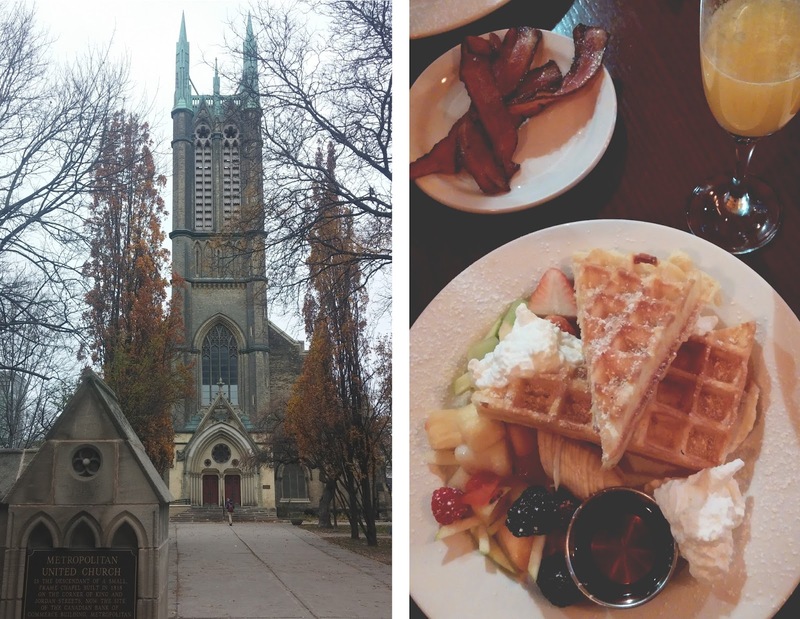 Toronto looks like a beautiful place to visit - you certainly made the most of your 48 hours there! 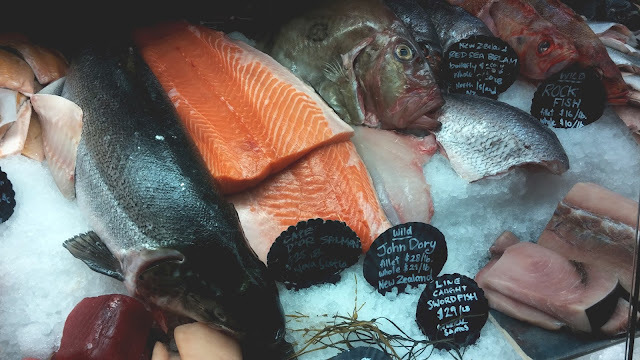 The Delta Hotel seems to have a great location and I love culinary tours to explore a city! Thank you Hannie! =o) You have to visit Toronto, it's a blast! Whooaaa I love your travel story! I like the photos and yes, food! You really had fun. Very good post, love the place, the photos and the story. I like to read travel stories with nice photos like this. Looks like a wonderful place to visit, a sustainable city with old charm. You are so sweet =o) Thank you! Thank you glad you like them! Such a fun adventure. Love these kind of spontaneous trips. I love Chicago. I lived there for four years. It's a great city. The view from CN Tower is breathtaking! You have great photos! I wasn't aware I was holding my breath as I was reading this. Have a great day! Thank you Xeph =o) The view was stunning! Can't believe you fit all this in 48 hours! You really crammed it all in! I haven't been to Toronto in forever, this definitely makes me want to go. I am a Torontonian and I'll have to say I agree with your recommendations! 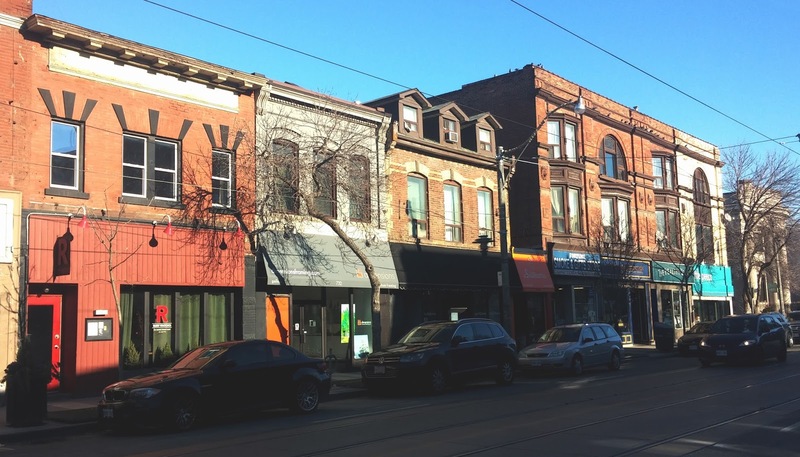 The East end and the west end of Queen St are definitely the places to go along with the Distillery market. Great guide! wow you got a lot done- great post!! I lived in Toronto for three years and so it was really interesting reading this through your perspective. The only other things I'd recommend doing in Toronto is visiting the St. Lawrence market and some of the ethic neighborhoods there such as Chinatown and Koreatown. How fun that you lived in Toronto! We wanted to visit St. Lawrence market but it was closed =o( definitely have to go back! The poutine and the beaver tail look so delicious! Loved seeing these images of Toronto as well, I can't believe how much you got done!